Bookworm Boutique: Hey there, Nerdy Post! There’s a new subscription box on the scene and this one is a little bit different, and I mean that in the best way possible! Alexis from @dropandgivemenerdy recently contacted me and let me know that she's setting up this amazing subscription service that I think a lot of you would be interested in, so let's give you a little bit more information. Nerdy Post will be much like other subscription boxes that you've seen, except this one will not feature a book. Instead, Nerdy Post will release a box each month that contains 3-5 hand lettered or illustrated items including "a high quality bookmark, auto-grade sticker, and high quality poster in monthly themes from books, TV, and movies" how awesome does that sound?! Hand lettered items have become very popular of late and are insanely beautiful pieces of work to look at so I am extremely excited to see what this box will have to offer! At the moment, spots aren't open for subscription but they will be soon! If you head to their landing page (click here) and click the 'Notify me when spots open!' button, you'll go in the draw to win an entire year's worth of subscription! You will of course also receive information about pricing, items that are included and such as well. Let's get real, guys... Not only will the items included in Nerdy Post look awesome on your wall, they will also look incredible as part of your set up for Booklr/Bookstagram photos, which is always a great bonus when it comes to things from subscription services. If you're interested in getting to know more about this amazing business, do make sure that you've signed up for that notification email (click here) and check Nerdy post out on Instagram (click here). Also, Alexis runs an amazing Bookstagram account (click here) which is full of incredible photos of books so check that out as well! Make sure to tell me in the comments if you're going to be stalking Nerdy Post like I did, and what kind of theme you'd most be looking forward to! UPDATE! NerdyPost is now open for subscription! The first box's theme will be HOGWARTS! How freaking exciting is that?! Each box will cost $21.00USD per month with free shipping to the US and Canada ($7 shipping to the rest of the world, but this still keeps the cost under $30 per box). 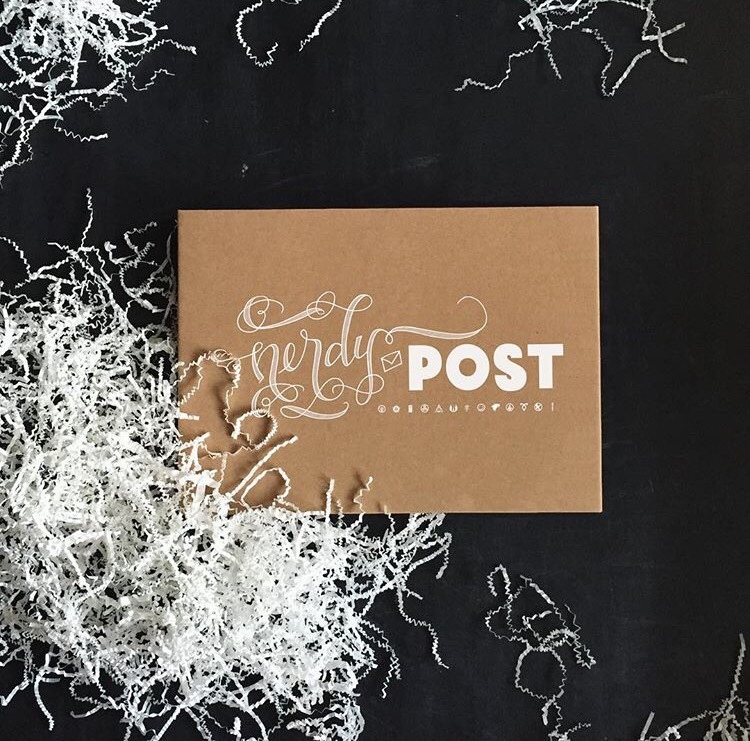 NerdyPost says "[Each box will contain] 4-6 items featuring original, hand lettered and illustrated quotes, symbols, images, etc belonging to that month's theme. Every month will always include a high-quality poster and bookmark, an auto-grade sticker, and a postcard that you can send or keep!" I don't know about you guys but I am incredibly excited to receive the first box for review, I absolutely love the idea behind this box! Hey TJ! Isn't it always so beautiful?! I'm always incredibly jealous of her work.